The year 2010 will be a year Mike Jones, owner of Warner Equipment won't soon forget. "The economy crushed us," said Jones. "For several years leading up to 2010, we continued to see a decline in our sales, but 2010 was the year we virtually sold nothing." 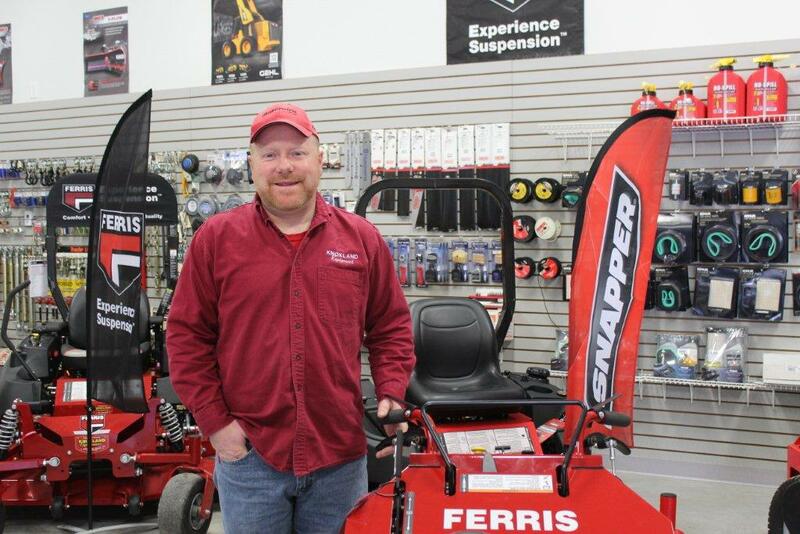 Jones is a second generation operator of the business, which sells and services farming, construction, and landscaping equipment. He now owns Warner Equipment, but does business as Knoxland Equipment, a well-known and respected company, where his father, Allan, started his employment in 1962 and later purchased. "This was my first job," said Mike, who, now the owner of the business, continues to work side by side with his Dad. After a devastating financial year in 2010, the company lost two of their three equipment manufacturers. "Our sales slowly started to rebound after about a year, but that wasn't good enough for two manufacturers," said Mike "The third manufacturer, Mahindra Equipment, really stood by us. However, they required us to obtain a full service floor plan in order to meet the minimum qualifications of their dealers. We found General Electric who agreed to finance the floor plan, but they required a partial letter of credit to reduce their risk. Our then current bank at the time couldn't help us, so that's when we reached out to CRDC. CRDC, Liz Sweeney, really listened to our story and understood our needs. She walked us through the process and got the loan approved." "Knoxland is a great company that hit a bumpy road like a lot of companies did in the down economy following 2008-2009," said Liz Sweeney CRDC Loan Officer. "We offered financing for the business after carefully vetting their financials and projections. Warner Equipment never touched the letter of credit, but it gave General Electric the security they needed, plus it gave Mike an opportunity to focus on rebuilding the company." Fast forward two years, and Mike Jones is now in a brand new building he built through the assistance of CRDC and Northway Bank. "If CRDC did not believe in us two years ago, we would not be the strong company we are today, we might not have even survived" said Jones. "We went from selling less than a handful of tractors in 2010, to selling close to a 100 last year. We couldn't be more thankful for the opportunity CRDC provided, especially because it came at a time when we needed it the most." Warner Equipment dba Knoxland Equipment moved into their new building on March 1, 2015.